We currently offer Ground, 2-Day, and Overnight shipping, Monday through Friday, via FedEx. Shipping charges are based on the total cost of your order and the number of ship-to addresses. Please see below for specific rates. Any additional handling charges or items that ship separately will be noted in a disclaimer on the item page. Unfortunately we cannot ship to Alaska or Hawaii at this time. 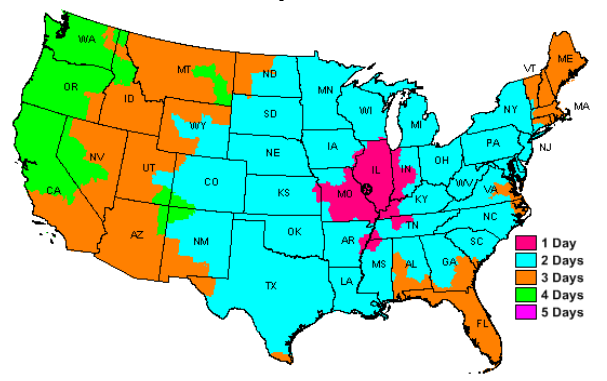 The following map shows the amount of time it will take for your Ground Delivery package to arrive. Please allow an additional day for preparing your order to ship. All orders are being shipped from St. Louis, MO. You will receive a FedEx tracking number with your shipment confirmation email. Shipping costs are calculated per ship-to address and are based on the total cost of your order, as illustrated in the following table. To make sure your glass bottled beverages arrive safe and sound every time, we ship each set of 12 bottles in a separate, sturdy carton. All beverage shipments will be charged a flat rate of $10.99 per carton used. All beverages are shipped via Ground only. If you have any questions regarding Beverage shipping cost please call 866-725-2121 ext. 31. Unfortunately we cannot ship to Alaska and Hawaii at this time. Orders that contain perishable items, such as meats, chocolates, or cakes (My Grandma's Coffee Cakes not included), will be shipped via FedEx's 2-Day or Overnight services. During the summer months of May through August, many perishable items will require overnight shipping. Due to the heat, we cannot guarantee that your order will arrive in prime condition. However, we do pack all of our heat-sensitive orders in insulated Styrofoam coolers with frozen gel packs. Steaks and cakes are frozen before shipment to ensure they are not damaged by exteral temperatures.